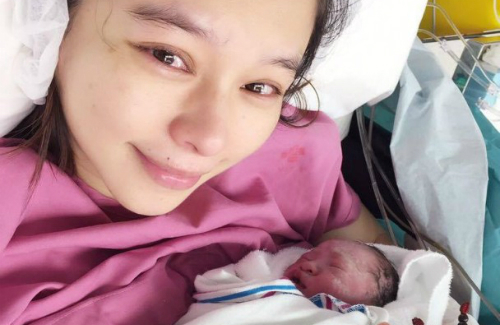 Taiwanese artiste Vivian Hsu (徐若瑄) successfully gave birth to a baby boy in Singapore via Caesarean section on August 13, 2015. The baby was named Dalton Lee and weighed 4.4 pounds at birth. As a first-time mother, Vivian shed tears of joy as she tightly hugged her healthy newborn. Dalton’s eyes reportedly resemble Vivian’s, while the rest of his facial features resemble her husband, Sean Lee (李雲峰). At 40-years-old and facing a higher pregnancy risk, Vivian underwent a cervical cerclage surgery to ensure fetal health. After the surgery, she was bedridden for 142 days leading to her pregnancy due to cervical incompetence and inability to bear the weight of her heavy belly. Having experienced a difficult journey, Vivian was extremely touched when she met her baby for the first time. She shared the joyous news with the press a few days after her son’s birth as she was trying to recover from mental and physical exhaustion. The artiste revealed there are reasons why she and her husband chose to name their son Dalton. First of all, it also ends with “n”, just like her and Sean’s names. Furthermore, Vivian has always treated Sean’s two daughters – Clara and Elisha – with his ex-wife as her own. Dalton’s name, which begins with “D”, fits between the two girls, and she hopes her son will get along with his two older half-sisters. Tears of joy! Her pregnancy wasn’t a smooth one, glad she had a smooth delivary.